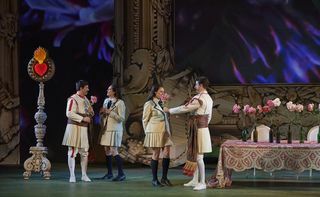 Atom Egoyan’s production of Così fan Tutte, first produced in 2014, returns with both its virtues and flaws on display. Having the two sisters dressed as schoolgirls brings forth a reference to Atom Egoyan’s 1994 film Exotica wherein a man becomes obsessed with an exotic dancer who dresses as a schoolgirl. Some people are intrigued by this, but I don’t think anything fetishistic is implied in this production of Così. There is also a lot of business with a huge blow-up of Frida Kahlo’s painting Two Fridas featuring two exposed hearts. One must admit that the word “cor” (heart) does occur in at least one aria, but extensive business with the painting shamefully upstages the scene where Ferrando and Guglielmo compare notes on their progress in wooing one another’s fiancée. The word “farfalla” (butterfly) also appears in an aria, and perhaps this inspired the plenitude of butterfly imagery which makes a very attractive stage picture at times. The casting is very strong. Kirsten MacKinnon (Pamina here in 2017) returns as Fiordiligi and she is a delight. Emily D’Angelo entered the COC’s Ensemble Studio in 2015 and in last year’s Operalia managed to win four top prizes; her fast-rising star is on full display. US tenor Ben Bliss is a natural for the role of Ferrando, displaying an attractive, youthful tone, while German baritone, Johannes Kammler, equally suits the role of Guglielmo. All four can be convincingly heartfelt and comical, but funniest of all is Tracy Dahl, returning as the cynical Despina. Everyone receives hearty applause at the curtain calls, but Ms Dahl’s has extra decibels. With respect to Russell Braun’s Don Alfonso, I would have preferred a darker voice for this manipulative character, even if just to distinguish him further from the other baritone. His handling of recitative is a model for all. It is always wonderful to have Bernard Labadie in the pit, sensitively molding the music in his inimitable style. The modern setting suits some of the stage action; for example, when Fiordiligi sings her great aria “Come scoglio” (Like a rock) she rises one hand, palm out, pointing to it with the other hand. This contemporary gesture (“talk to the hand”) indicates “I am ignoring you” as she refuses to go along with Don Alfonso and Despina’s urgings to abandon her fidelity to Guglielmo. This prompted laughter from a part of the audience. There is much to enjoy here. Just try to ignore the extraneous fussy business.